Listen Lady Blog – My tiny view on life. Well ladies & gents, it’s been exactly one year since the giant spleen surgery. It was a LONG haul to recoup and even now I have some residual pain left in the scar from nerve endings that healed over in the scar tissue. Overall, things are 100 times better. I can walk and sit without feeling my organs pushing against each other and I can hold my kids again. Based on just those two items, I’m miles ahead of where I was this time last year. Plus I’m not laying in a hospital, with PICC lines or worrying about transfusions and collapsed lungs. Cardin asks me frequently when my scar will go away, but I don’t mind my battle wound. 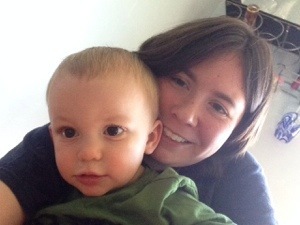 It reminds me I’m not invincible and how close I was to not seeing this little boy grow up to be the awesome toddler he is. Listen lady, how can you not love that face? I do declare today a national holiday and so I give you happy spleeniversay day!! You don’t really notice the daily changes in your kids since you are with them so frequently, until you pull something like this. Cardin started Pre-K this week and I’m befuddled at the growth from last year. She’s grown a whole head and her book bag fits like a real kid now!! Though the picture doesn’t show it, she hasn’t grown just physically; she has grown socially and academically as well. We are very excited to see how she will grow and what she will learn this year. 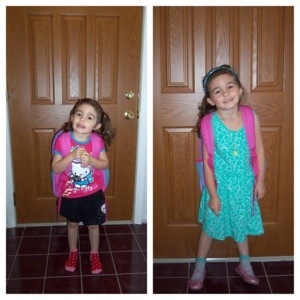 However, I’m already dreading the day I have to put my bug on the bus to go to kindergarten. A few weeks back I stepped outside on my lunch break to call and check in on the kids. While I was chatting with Cardin over the philosophical rule of Mr. Grouper from bubble guppies, I noticed a grasshopper on a leaf. I mentioned the grasshopper to her and told her I’d take a picture of it and she could see it later when I picked them up. 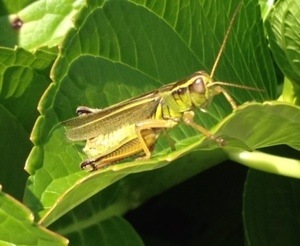 It is as though the grasshopper has taken up residence at my office, has a dedicated cubicle, and attends daily meetings. The grasshoppers action items for this meeting: eat plant. Please plan to provide a status description by weeks end. Poor kid has no clue that Mr. Hopper has probably been eaten by some frog or bird looking for a good meal. Lady, remember that time I wrote about our new neighbors and Brett and I made the conscious decision to not let our kids play with the neighbors due to the lack of parental supervision? Yea….call it selfishness, call it mothers intuition, call it whatever you like, but Thursday afternoon my next door neighbor was charged with second degree murder. What makes it worse is that she had the kids in tow with her when she allegedly committed the act. Needless to say, we were flabbergasted. Our quiet street has been a cluster since Thursday. I really do feel bad for the two kids. At 4 & 5 years old they’ve been dealt a rough set of cards. Won’t lie, my families safety comes first and this may speed our time line for moving.